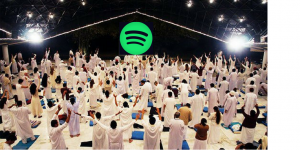 Spotify artists gather to pray to the playlist gods. Ok great that means Spotify is going to find a playlist for every single artist who submits for playlist placement, everyone will gain millions of streams and dreams will come true. Not exactly! Keep in mind this feature is still in Beta (unfinished version). Who gets onto a playlist and who doesn’t is going to come down to one thing, listener data. 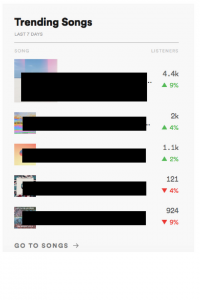 If users are adding your record to their playlist, saving your song, and you’ve got a relatively low skip rate…you will have a much higher chance of getting slotted onto an official Spotify list. Here are a few things to do now that can help you get placed onto these bigger lists and take advantage of this new feature. Clean up your Spotify profile. If you have songs on your profile that are not performing well now would be a good time to clean it up and take down those songs. If a song is not gaining you new listeners and is maintaining a lo w save/listener rate (lower than 10%) now could be a good time to dump those songs. Along with your music make sure you have clean images on your artist profile and have a brief but engaging bio. Bonus points if you have a decent social media following that contain a few posts about your music on Spotify. One post about Spotify on one of your profiles could come down to you getting placed on a list or not. Get your music on user generated playlists. This is not an easy one but finding user generated playlists that can actually gain you streams is extremely important when building listener date for your profile. Finding these playlist curators can be extremely time consuming an frustrating. Not everyone is looking to help you out and finding a playlist that can gain your streams is not easy. Using a service like PlaylistPush.com can help you to connect playlist curators who’s playlists have been verified that they can gain you streams. Getting on these lists can also help you to trigger Discover Weekly, feeder playlists like Fresh Finds and the artist Radio feature. Blogs are not dead. Gaining blog coverage on blogs like The Fader, Elevator Mag and Pitchfork are still a piece of the puzzle when gunning down an official playlist placement. Hypem used to be an important part of the equation with tracks doing well on Hypem being placed into feeder playlists like Friday Cratediggers Hypem has become less of the equation because they have lost significant traction with tastemakers and have less of an impact on SEO ranking. All in all playlist placement should be a far off dream for newer artists. Spotify is all about playing the long game, consistently releases quality music, getting that into listeners ears via user generated playlists and listeners reacting in a positive way. There are no shortcuts and there is no magic bullet, create good music that people enjoy and you will land plenty of spots on official Spotify playlists.